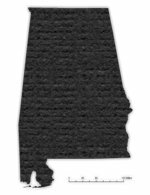 "Hotter climates can pose unique challenges to home owners as some roof materials do not withstand the heat as well as others"
Residents living in the State of Alabama have two areas of concern when deciding on a material for a new roof. Firstly, it is a southern state, which tends to get high temperatures in the summer months. Hotter climates can pose unique challenges to home owners as some roof materials do not withstand the heat as well as others. Secondly, Alabama has a coastal region that is subject to increased levels of moisture, specifically, salty sea air. Coastal areas must take into consideration the effects of increased moisture when choosing a roof material. Roof materials that possess both of these qualities are clay tiles and composite asphalt shingles. Both of these products tolerate extreme temperatures well and come in a variety of colors. In general, a lighter color will allow for more reflectance and less absorption by the roof materials. An ideal roof material for humid or high moisture climates would prevent dampness from soaking into the underlying materials and prevents mildew or algae growth. Surprisingly, metal roofs are a great choice for wet climates as they are coated with a rust-resistant, water proof and algae deterring top coat. Metal roofs also offer higher wind resistance than traditional shingles, making them more resistant to hurricane-force winds.